I am happy to report that I had a wonderful time at Darwin Day 2012 last week at the Texas Memorial Museum – the first public event for the biocreativity blog! 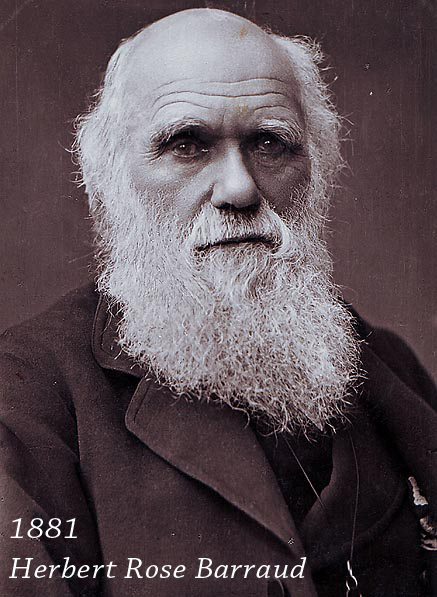 For those of you who aren’t familiar, Darwin Day is an international celebration of the birthday of naturalist and evolutionary biologist Charles Darwin, who was born on February 12, 1809. I hosted a booth at the Darwin Day celebration to make a big portrait (3 x 6 feet) of the great naturalist using images of biodiversity cut out of National Geographic magazines that were so generously donated by Half Price Books. This was a really fun process, and the kids and the adults seemed to love it, too! But, from selecting the base image for the portrait, to putting the finishing varnish and installing hanging hardware, pulling off the Darwin Day Portrait Project was quite a job, and I couldn’t have done it without my husband, Cole! Interestingly, Rejlander’s collaboration with Charles Darwin on his 1872 book The Expression of the Emotions in Man and Animals, earned the victorian art photographer an important place in the history of behavioral and psychiatric science. The book is an excellent example of art-science collaboration in the 19th century. It defined Darwin’s contribution to the field of psychology and put Rejlander on the radar of other prominent scientists of the time. This book is also a pioneering influence in the work of modern psychologists studying human emotions through body language and microexpressions, including prominent psychologist Paul Ekman (a fictional version of Ekman was recently portrayed by Tim Roth in the Fox series Lie to Me; Ekman was also a guest on WNYC’s RadioLab episode on catching liars). 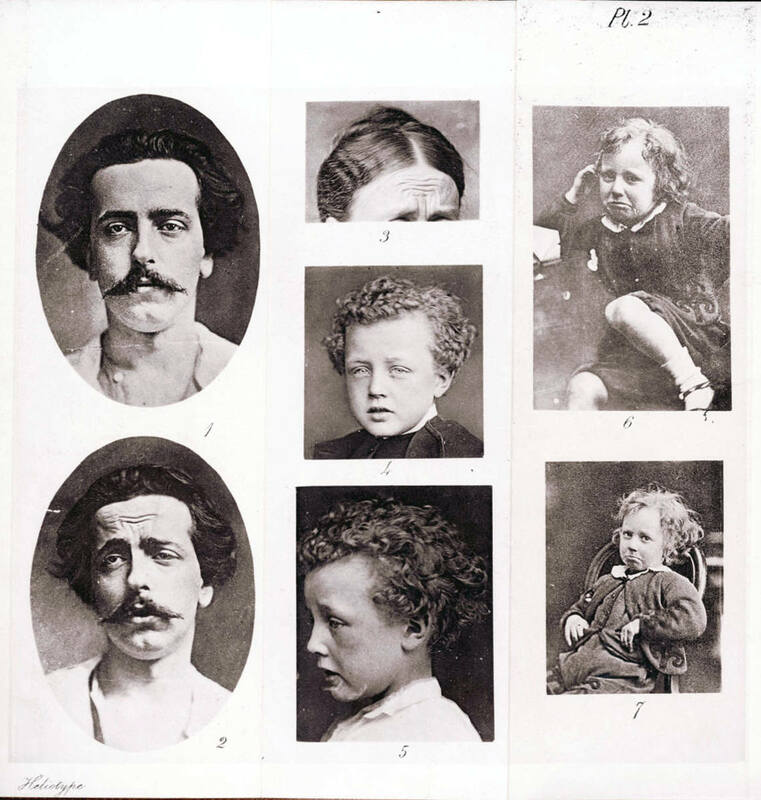 Photographs illustrating emotions of grief from Charles Darwin's work "The Expressions of the Emotions in Man and Animals," published by J. Murray, London, 1872. Image courtesy of the Beinecke Rare Book & Manuscript Library, Yale University. This is likely the work of Oscar Gustave Rejlander. There were many other interesting portraits I could have chosen, such as this strapping young lad just returned from his voyage on the H.M.S. Beagle from this late 1830’s watercolor by George Richmond. 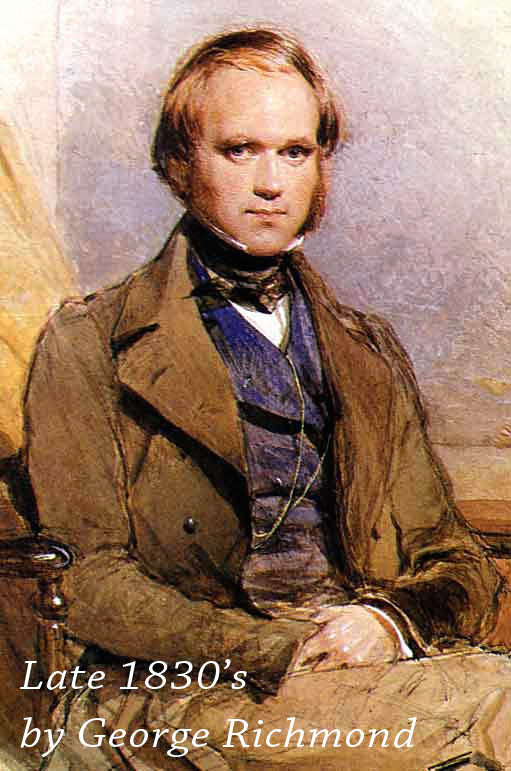 1830's watercolor portrait of a young Charles Darwin by George Richmond. 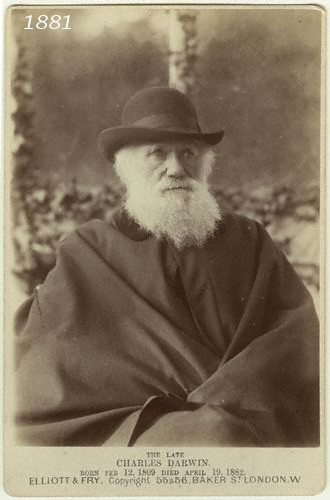 Or, this photograph by Baker Street photographers Joseph John Elliott and Clarence Edmund Fry, who produced many portraits of Darwin throughout his life including this one, which is one of the last photographs taken of the evolutionary biologist before his death on April 19, 1882. 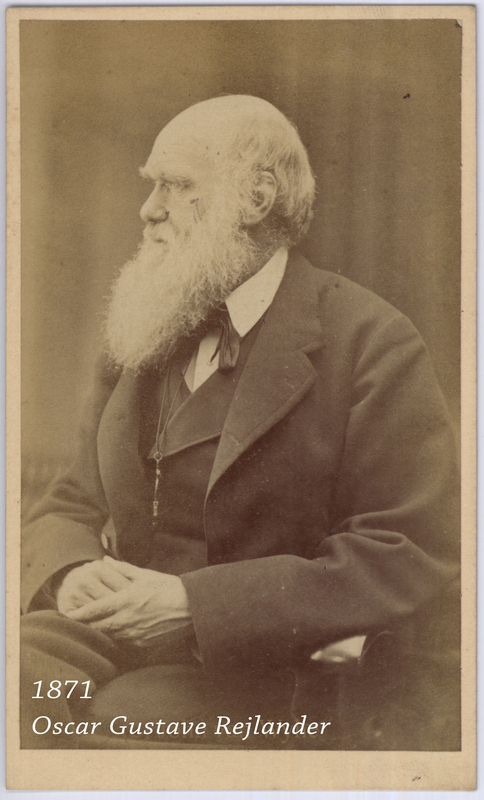 November 1881 photograph of Charles Darwin by Elliot & Fry, London. 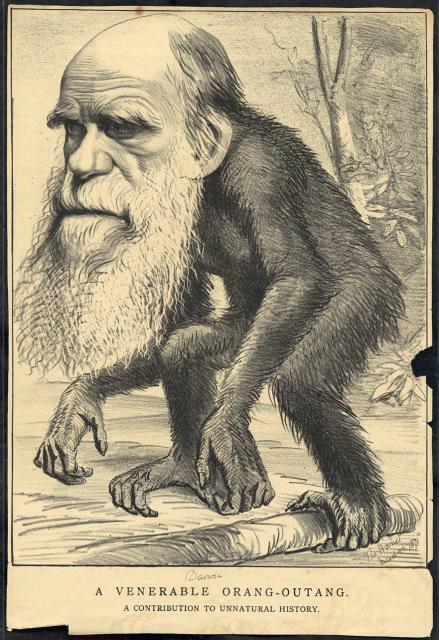 1881 Woodburytype image of Charles Darwin by Herbert Rose Barraud. 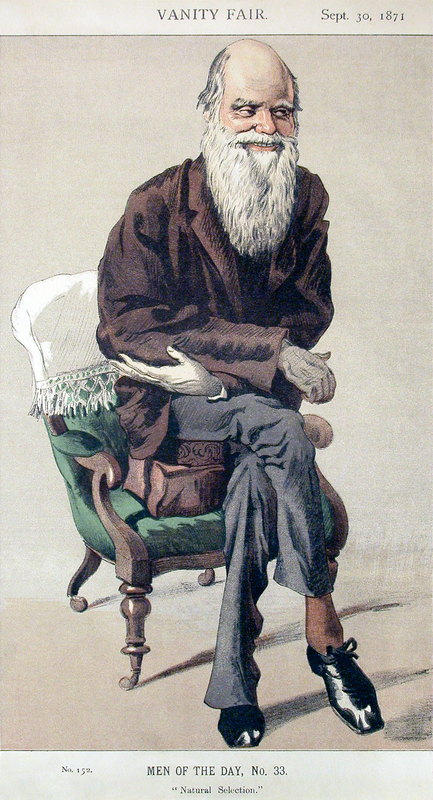 Caricature of Charles Darwin, “Men of the Day No. 33., Natural Selection”, which appeared in Vanity Fair, September 1871. Another interesting art-science connection comes directly from Charles Darwin’s personal life. His wife Emma Wedgwood Darwin was the granddaughter of Josiah Wedgwood, founder of the world-famous Wedgwood and Sons pottery firm in 1759 (which is still in operation today as Wedgwood Waterford Royal Doulton). 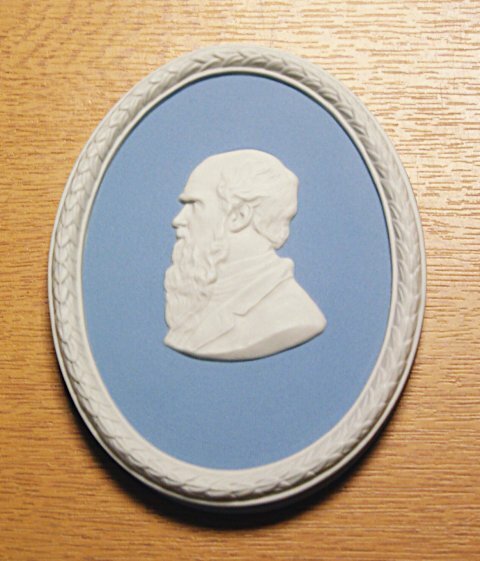 Here’s one of Wedgwood’s iconic Jasperware cameos, in “Wedgwood blue”, modeled in the likeness of Charles Darwin. A Wedgwood pottery Jasperware cameo of Charles Darwin, based on an 1881 portrait. 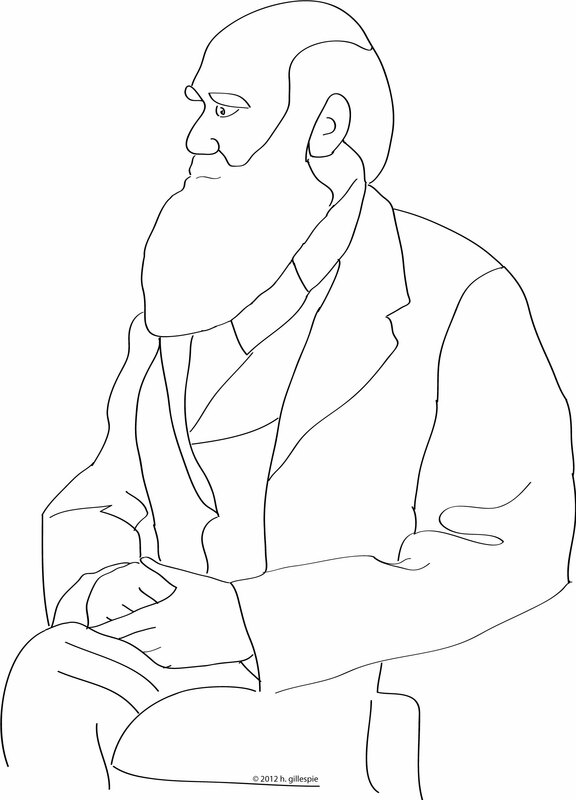 Of all of these intriguing portraits, I needed something for the Darwin Day Portrait Project that could generate simple lines for a color-by-number template. Rejlander’s photograph provided just that, and so I used it to generate this simple outline that I projected onto wood panel to create the collaged portrait. Then came the fun part: putting on the collage! The kids had a great time at the Darwin Day celebration at the Texas Memorial Museum pasting images of the great diversity of life onto Mr. Darwin’s image. Indeed, it was a four-hour non-stop bombardment of excited kiddos (and even a few adults) coming at me to make their mark on the portrait. I also had a fun conversation with Austin American-Statesman reporter Farzad Mashood, who later filed this report from Darwin Day 2012, and left his mark on the Darwin portrait. While I scarcely had time to breathe, my amazing husband Cole helped cut out images in the colors we needed, took photos and helped direct things as I pasted the day away! While the kids seemed to have a lot of fun looking for their favorite animals, nearly all the parents reminisced by flipping through the piles of National Geographic. “I loved this magazine when I was a kid!”, many of them exclaimed as they watched their kids fill in the Darwin. The joy of appreciating the natural world, just as Darwin did for 73 years, and for its own sake, was apparent in their expressions as I invited to take a copy home with them. This is why I’m a biologist. Helping people enjoy science is one of the most rewarding things that I do. We were lucky enough to capture a time-lapse of the Darwin Day Portrait Project (though the museum was a bit dark for good photography, and because the kids needed to be able to reach the wood panel there are a lot of derrières in the ground-level photographs!). It’s taken a little more than a week to put the finishing touches on – filling in gaps in the collage, painting on the outlines and putting on a protective varnish. Very soon he’ll be hanging in the Texas Memorial Museum, and I’ll update this post with his location. Many heartfelt thanks to all of the participants, to Christina Cid, Director of Education at the Texas Natural Science Center and Texas Memorial Museum and her crew of volunteers, and to Half Price Books Austin (South Lamar and North Lamar locations) for their generous donation of National Geographic and Science magazines for this project. And, as I mentioned above, my husband Cole was instrumental in the development of this idea, and its successful execution. Thank you, and Happy 203rd Birthday Charles Darwin! Signatures of the many participants who made their mark at the Darwin Day Portrait Project. 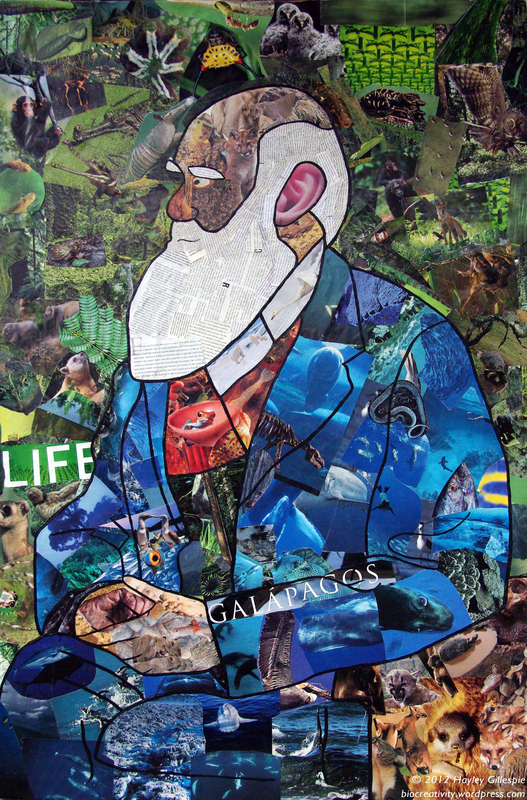 This entry was posted in art, evolution and tagged art, biology, Charles Darwin, collage, evolution, portraits by h. gillespie. Bookmark the permalink. This is wonderful, Hayley! Thanks so much for sharing so much about the process!